Go to any Chinese restaurant and order your favorite entree. If you are lucky enough to grab the meal deal, you usually get your choice of white rice, brown rice or fried rice. If you are trying to watch what you eat, you probably order the white or brown rice. I, on the other hand, have devised a marvelous plan to avoid the decision-making process. Order the brown rice, that is of course the best decision. Hope, really really hope, that Ryan orders the fried rice. He has a lightning-fast metabolism, what does he care? Then, when he’s not paying attention, sneak a little bit of fried rice. Maybe more than a little. Great plan, right? Not so much. The best way to avoid the rice dilemma is to make a healthier version that you don’t have to debate over. 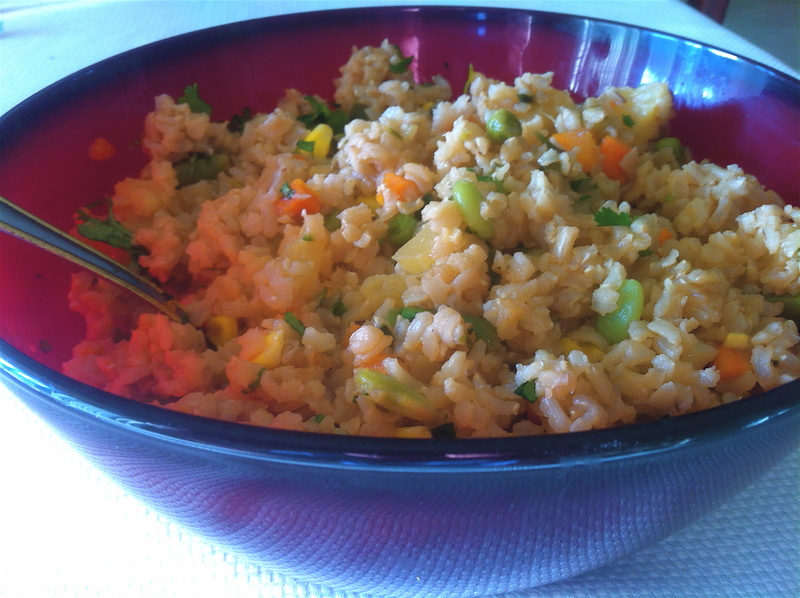 One that combines all the great flavors of fried rice without the excess calories. Sweet, crunchy, and a delightful accompaniment to homemade Orange Chicken. Bring two cups of water to a boil. Add the rice and cook on a low temperature according to package directions, about 20 minutes. While the rice is cooking, heat a large saute pan with a drizzle of vegetable oil. Add the onion and garlic; cook for 3-4 minutes until it starts to brown. Add the vinegar, pineapple, and pineapple juice. Cook another 3 minutes. Add the oil, soy sauce, and hot sauce to the mix. Reduce to low heat until the rice has finished cooking. When the rice has finished cooking, add the 2 tbs vegetable oil to the pan. Increase the heat to medium-high and heat the oil and remaining ingredients. When it’s nice and hot, add the rice and mixed vegetables to the pot. Cook until the rice becomes a little crispy and starts to brown.